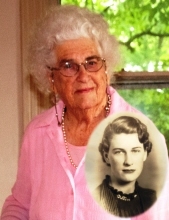 Emma Sue Adams McDaniel, 102, resident of the City of Senoia, Coweta County, Georgia for 61 years, passed from this life at home, Saturday, 6 April 2019 of natural causes. Sue was born 22 May 1916 in Noxubee County, Mississippi to Abram Thomas Adams and Mary Columbia Tumlin Adams. Her parents had the first dairy farm in the county and her childhood was enjoyed with numerous kin near the home place of her paternal pioneer Adams, Garner and Thomas ancestors. Sue’s maternal ancestors (Paden, Reid, Tankersley, and Tumlin) were pioneer settlers in Tishomingo County, NE Mississippi, where her grandfather, Marcus E. Tumlin, retired as a Methodist Episcopal South minister. Sue’s strong Methodist faith was nurtured first in her primary family and continued all of her life. Emma Sue graduated from Macon, Mississippi’s High School in 1934. Sue was the fifth of eight children, and the last to pass away. Adams siblings were Mary Ernestine 1907, Gladys Evelyn 1909, Ethel Alene (Flurry) 1911, John Marcus 1914, Maude Reid (Williams) 1918, Willie Jean (Read) 1921, and George Perry 1924. Generations of nieces and nephews were cherished by Sue and they returned` her love. Sue was preceded in death by her husband of seventy years, Willis Olin McDaniel in 2006, and her grandson Randolph Richard (Randy) Ray in 2017. Sue is survived by her daughter, Dr. Barbara Jean McDaniel Ray (Dr. Dale Carney Ray) of Atlanta, GA, and her son, Olin Adams McDaniel of Senoia, GA. Other descendants include grandsons Dale C. Ray, Jr. (Denise Johnson), of Suwannee, Ga., Gregory Olin Ray of Lawrenceville, Ga. and Geoffrey Andrew Ray of Asheville, N.C. Great grand children are Amanda Sue Ray, Alexander Maxim Ray (children of Dale Jr., and Denise); Erica Emily Ray and Ava Oksana Ray (children of Geoffrey Ray and Lisa Anne LaVallee). Between 1936 and 1957, Sue was the very best military spouse, where U. S. Army Ordnance duty located the family in the southeast and southwest USA, Japan and Italy. Col. McDaniel retired from the military in 1957 and the couple settled in Senoia in his Travis ancestral home. Here they welcomed frequent visits from grandchildren and other family sharing noteworthy skills in cooking, gardening, fishing and sewing. Very importantly, Sue’s extreme memory enabled her life as a beloved story teller and the keeper of her family’s history. Once settled in Senoia, Sue embraced Olin’s family and community friends as her own and kept his Georgia roots stories alive, even now in print and film. Since 1991, their Victorian home has been celebrated as “the Fried Green Tomatoes House” after the location there in Senoia for the movie of the same name. In the 1960s and 1970s Sue was a valued retail employee at J P Allen, commuting often by bus to Atlanta. Olin’s dedicated second career as a teacher at Fayette County High School was strongly encouraged and supported by Sue. Known to his students as “Mr. Mac”, Olin valued being a high school teacher of math and physics as the most meaningful work of his life. Sue was greatly loved and will be sorely missed, as a parent, grandparent, great grandparent, aunt, cousin and friend. Known locally, as “Miss Sue”, it is said that if you had Sue McDaniel as your friend, it would be hard to know a better one. Services to celebrate Sue’s life will be led by the Rev. Ashley Jenkins and the Rev. Erik Mays, at 2:00 p.m. Sunday, April 14, 2019, with viewing preceding the service at 1:30 p.m. at Senoia’s United Methodist Church, 229 Bridge St., Senoia 30276. Expressions of sympathy may be made in the form of donations to the Senoia United Methodist Church, P.O. Box 98, Senoia, Georgia 30276. Burial will follow at the Senoia City Cemetery. Arrangements are by Carl J. Mowell & Son Funeral Home, 200 Robinson Rd., Peachtree City, GA 30269 770-487-3959. To send flowers or a remembrance gift to the family of Sue A. McDaniel, please visit our Tribute Store. "Email Address" would like to share the life celebration of Sue A. McDaniel. Click on the "link" to go to share a favorite memory or leave a condolence message for the family.